Another CBS Early Show shark feature can be found at http://www.cbsnews.com/stories/2010/03/05/earlyshow/living/petplanet/main6269941.shtml?tag=latest . 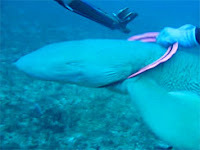 It concerns a diver wrestling a nurse shark to remove a frisbee caught around its body. There's a photo and video footage of the feature.